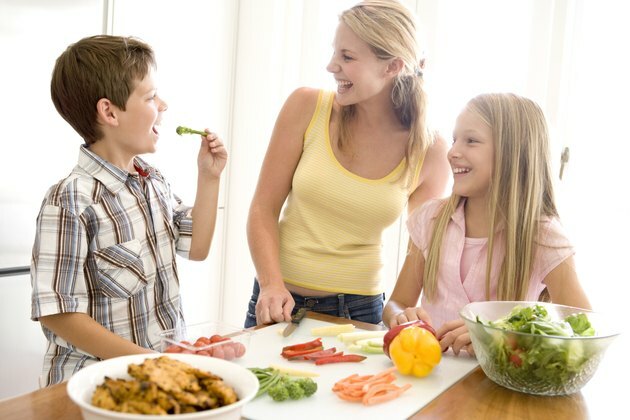 How Does Teen Nutrition Affect Growth, Development & Learning? Carbs, proteins and fats all play important roles in a teen’s diet. Carbs are a teen’s main energy source and an aid to keeping blood sugar levels under control, which can prevent sudden energy crashes and may even improve focus. Proteins contribute to healthy organ and muscle growth and development and are overabundant in most teens’ diets. Healthy dietary fats promote proper skin and hair development and help teens absorb other essential vitamins and minerals. Micronutrients, including calcium and iron, are also critical for teens. Specifically, a research review published in 2005 in the "Journal of School Health" concluded that iron-deficient students were at an academic disadvantage but improved cognitively after undergoing iron therapy. Teens need a lot of calories throughout early adolescence -- about 2,800 daily for boys and about 2,200 daily for girls. However, if they’re eating a lot of junk food or just overeating in general, overnutrition and weight gain can become a problem. Excess weight gained during adolescence doesn’t often go away automatically, even after growth spurts. According to the American Academy of Child & Adolescent Psychiatry, an obese adolescent has an 80 percent chance of becoming an obese adult, which raises long-term risks of heart disease, diabetes and sleep problems. Teens who are obese also tend to have lower self-esteem and greater emotional difficulties. One of the most important nutrients for teens is calcium, but two-thirds of American adolescent girls don’t meet daily requirements for the mineral. According to the American Academy of Pediatrics, your bones begin to stop taking in calcium deposits by the time you reach early adulthood, which is why it’s critical to get enough calcium as a teen. Teens who don’t meet calcium requirements have higher risks for brittle bones, bone breakage, stunted bone growth and osteoporosis later in life. Teens with poor eating habits are at risk academically as well as physically. An unhealthy diet doesn't meet daily recommendations for fruit and vegetable intakes and consists of mainly processed foods, refined grains and foods that are high in fat, sugar, cholesterol, sodium or all four. According to the Centers for Disease Control and Prevention, students who practice unhealthy eating are more likely to receive poor grades, get low test scores and pursue less education. Relatedly, teens who do not get enough food and are often hungry are more likely to miss school or repeat a grade, according to the National Education Association.